Most of the people are used to search; how to start a blog for free? How making money from a blog? What to blog about? How to start a blog and make money? List of best blogging platforms? moreover, they find about how to start a blog on facebook? Or how to start a fashion blog? What should I blog about? But only those serious, try to search about major things to know before starting a blog. Indeed there are lots of newbies are coming & it's because of the earnings that the popular bloggers are getting. A skilled person may find it easy, but that doesn't happen with everybody. It's not like you to write a post & getting tons of traffic & earning huge; you certainly have to work hard. Clearly, blogging is an art, and you will know it & learn it when you start writing. It's really not going to happen overnight; "Rome was not built in a day;" you need to wait till an opportunity strike. 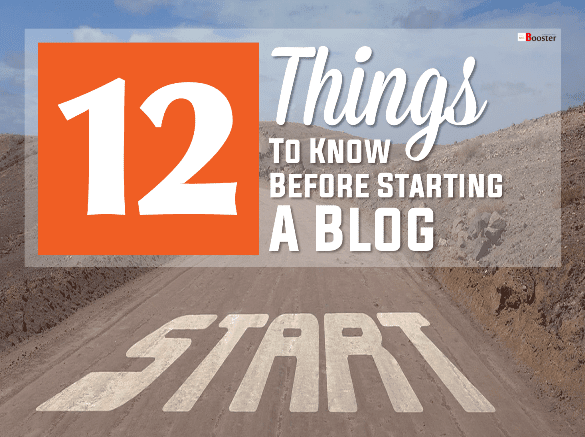 So here are a few things that one should know before starting a blog so that they can save their time which they may gonna waste doing blogging mistakes. 1. Find the reasons to start blogging. Before starting any work, we have some motive behind that. You must require being sure of why you actually want to start a blog & what exactly you wanted to share through it. Everyone has a different purpose. Someone want to start blogging as a passion or to build online reach or to grow the business. So now it's up to you to know what's your reason to blog. Whatever idea you have, the ultimate aim is to earn money. Those who want to blog as a passion will not worry too much. But most of the people start it as another source of making money blogging. Yes, it's right, the blogging has that much potential, but nobody guarantees it. Every business has uncertainty. It will worth, but nobody knows how much time it will take. It totally depends upon your ability, approach, working. Really it's not that easy that a newbie thinks. It's not that much difficult to earn from blogging. You need to get more traffic to your blog & should know how to monetize it. 2. Discover your blogging purpose. Yeah, its must & most important thing to do before starting a blog. You can't write anything you want. Your writing should be up to the mark & for that, you have to select a topic for your blog. You can choose a topic that you are interested in or the recent topic that people are interested in. Choosing a topic of your interest will boost you to write more, but that doesn't mean choosing a subject of people's interest can't make you a successful blogger. It's all about being passionate. The more passionate you about a topic, the more you can write, and more it will touch the reader's heart, the more you will get the traffic & the more you will be successful. 3. Choosing a perfect domain for blogging niche. Once you have chosen a topic that you are sure about, then it's time to choose a domain name. It's the name of your blog; your blog will be identified by the domain name you have selected. So be careful & selective while choosing domain as it's your online identity. It should be short, easy to read & should clearly indicate what your blog is all about. After reading 5 Reasons Keywords Are So Important for SEO Optimization you will get to know that it's better to have the keywords in your domain name which shows the theme of your blog. E.g., if you are blogging about cricket then it should be like crickbuzz.com. 4. Pay to get paid. Wordpress is costly because you have to buy a domain as well as web hosting & it suits well for corporate sectors. Apart from this, you should spend for designing, coding, marketing, development, etc. & this actually costs more, so be prepared to spend enough whenever there is need if you want to be a successful blogger. 5. Develope content writing skills. Writing a big, indetailed content is still the first choice by Google to get your website in search ranking & it remarkably works till now. Google likes the contents written in detail. That also benefits you to get more internal links. If your writing contains only around 500-600 words, then nothing is gonna happen. You should write at least 1500-2000 words. If you see Google's result page SERP; you will notice that all the top ranked sites contain a minimum of 1200 words. But it doesn't mean, you extend your writing without any base. Your content still should express what you want to say. There is a huge population who like to read every day & writing a short content will obviously upset them. 6. Connect & grow frindly blogging network. It's just like making it large for me. From performing to being a regular blogger can be a hard job but when you have other similar minded people in your niche those are selling in the same boat, it makes that stress so much lighter. In this blogging industry, I have been so much fortunate to find a great community of bloggers who have now become my friends. They are always ready to answer my queries, give me an encouraging piece of advice, like my photos, regularly comment on posts, and yeah, they genuinely want me to succeed. It's extraordinary to me. With the social media, it's remarkably simple to find your related group. There is an immense number of groups for bloggers on Facebook which is a great place to begin to get connected on social sites. Visiting webinars or online seminars, hangout conferences or YouTube live channels can also help you to get connected with other professional bloggers to join with. For blogging, you need to spend hours & hours sitting in front of the computer. It's not gonna complete in one or two hours. According to the recent studies, sitting for a long time can increase the chances of early death. Sitting for an extended period of time decreases the peristalsis movement of the stomach which results in indigestion, acidity, headache, back problems, etc. & it's a fact. You may have to face such kind of challenges in the future. So stopping writing or quitting blogging is not the ultimate solution for this. Just be sure to find some solution like stretch your muscles by moving your parts of the body, take a break for few minutes at some intervals, but take a long break as it can cut off your writing link. 8. You have to be consistent. A consistent hammer succeeds to break the rock. You need to be consistent to retain & grow your readers throughout. Someone may not realize this until they are affected by the loss of readers. People want to read daily & if you are not consistent, they may leave and run away from you creating, almost null chances to get back to you again & losing reader means a decrease in income. So consistency is a must, you can attract more readers through it. 9. Pick sober & catchy website design. Design your blog site in such a way that, once a reader read your blog he/she shouldn't go anywhere since then. Think carefully about every little thing. It should be best enough to retain your readers & attract more. Look at your font size, create content easy to read & understand, have enough space for ads. Also, design your blog mobile & tablet friendly because these are the first choice for internet these days. Google has started to remove those sites which don't support to mobiles. 10. Know social media power. As a newbie, if you think that you also will get the same amount of traffic as most of the popular blogs are getting, then its time to rebuild your thoughts. You won't get the same no. of traffic because you are new in the field. It takes years to build such kind of traffic. The best way to get traffic is social media. Promote your blog posts through social media like Facebook, Twitter etc. because anything posted on it goes viral within a short time. Social networking sites are the best ways for social marketing these days. You can drive massive traffic through this, just be active on it. Chat with people, share & comment stories, make new friends etc. This is the best way to make your blog popular, just be sure that you shouldn't spend all your time on it. Your success depends on a lot on the network that you create. So make connections early on. 11. Focus reader & his needs. 12. Start as a part-time work. Blogging takes too much time to open its doors for you as there is a huge competition in the blogging industry. So start it as part-time & once you started your desired earnings then you may think to start it for full time. This is because I have seen a lot of newbies start it as a full time being unaware of the time it takes to earn. Sometimes it makes them difficult to pay their bills. Also as I mentioned earlier, it requires some investment. So it's better to start it as part-time. If you see; there are major advantages & disadvantages of full-time blogging, but hopefully, this will give you a better idea that what precautions you have to take before & after starting a blog. I know it's bit hard to follow all the precautions at the start, but you will make it easier once you have the practice.